Pakistan is a country of 170 million people, who are spread all over and it has been blessed with the best natural and human resources. It has the hills and mountains, a 1000 km long coast line, sea, lakes and rivers, valleys, oil and gas fields, mines and huge natural resources through capacity to grow staple food products to fruits and vegetables. Pakistan borders with China, India and Afghanistan and is one of the easiest sea route for transfer of goods to Afghanistan, China and India (especially the first two). 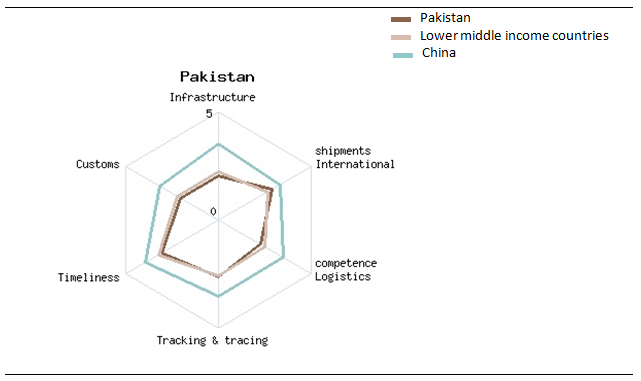 On comparison, Pakistan seems to be lacking in many different areas as the radar chart (source: WorldBank database) below indicates. It is interesting to note that although Pakistan fares roughly equal to other lower middle income countries in the region, however, in comparison to its neighbour China, it definitely has a lot of learn and implement and there is ample room for improvement in all the areas of operation and management. The highest gains can be made in the infrastructure, where government-private sector relationships and government’s iron-willed determination and honest commitment could do wonders. If Pakistan is willing to chalk out its strategy for trade and production management, the country can claim massive gains in the fields of shipping, logistics, trading, manufacturing, rentals generated by government and semi-government institutions for various infrastructure facilities’ usage such as storage & handling charges. Moreover, development of ancillary industries could thrive due to the ripple effect. Such a policy would bring in all the stakeholders on the decision table and take them into confidence on the longer-term beyond-the-nose kind of planning not seen of late. This would entail not only vague ideas but practical plans and milestones in each domain and follow through of ideas till implementation and post-implementation support. 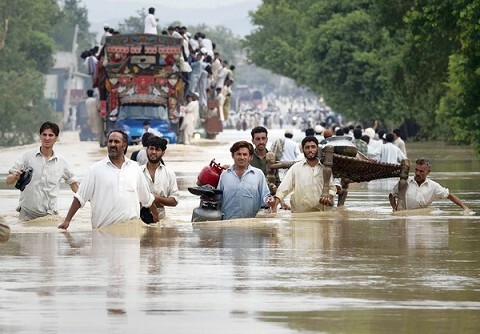 Given the geo-strategic positioning of the country and the enhanced value of the location in light of the emergence of a stronger China and a post-war Afghanistan (being a land-locked country), Pakistan can definitely capitalize on the opportunity to develop a brighter tomorrow for itself, rather than depending on the foreign aid to push through this difficult time. In fact, this country has the potential to become a major shipping center in the region once it streamlines the infrastructure deployment, brings in competent people management and the government is able to control the security situation in the country.